Human resource leaders today face a fluid and unique environment unlike ever before. Employees expect not only a productive but also an engaging and enjoyable work experience. According to a 2017 Global Human Capital Trends report, more than 42% of executives report employee experience as an important workforce management trend. However, only 22% of companies have the right strategy and technology to build excellent employee experience. For organizations looking to build a differentiated employee experience, leveraging leading HR practices and managing workforce lifecycle by integrating HR platforms is a must. Inspirria Light HR solution built on NetSuite’s Suite is designed to help organizations manage HR operations efficiently. It not only provides HR leaders with a unified view of the employee database but also helps track and optimize people performance. 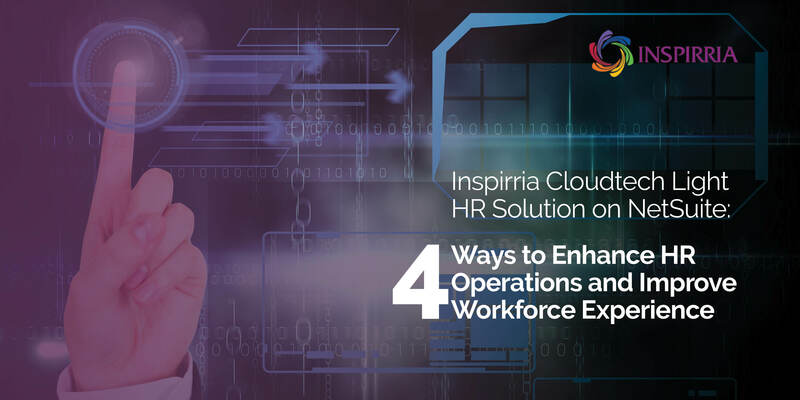 With Inspirria Light HR solution, organizations can access a centralized database for total control of jobs and status tracking, as well as regulate new hire requisition approvals and budgeting. The Light HR solution also enables companies to easily manage global employee records, government IDs, certifications on NetSuite ERP. The result: improved workforce management and hiring control. In an increasingly competitive talent market, employee and manager self-service options help create a positive work culture and retain top talent. Inspirria Light HR solution provides a self-service solution to employees and managers to request time-off, access employee directories and organizational charts, as well as monitor upcoming vacation. In addition, various features such as manager reporting make employees self-sufficient, allowing them to be more productive and focus on strategic initiatives. Organized payroll process is critical to administering accurate paychecks as well as ensuring compliance related financial reporting. Inspirria Light HR solution makes payroll management easier by helping organizations easily access payroll features such as multi-jurisdiction taxes, benefits and deductions as rates. The advantage: seamlessly track and pay employer and employee payroll taxes, monitor tax law changes, provide current and cumulative online pay statements and monitor tax law changes. Improving workplace productivity means gauging workforce efficiency, identifying diligent workers, and determining proper compensation for your workforce. Inspirria Light HR solution seamlessly embeds performance monitoring & Goal settings and recognition into the workforce routine through enabling managers to recognize and reward good performers on the fly. Inspirria is a leading NetSuite partner offering cloud Light HR solution on NetSuite ERP implementation services . We leverage more than 14 years of experience and data-driven strategic cloud assessment capabilities to help companies drive significant HR efficiencies.